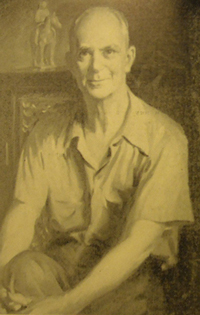 Frank Klepper is best known for the mural he painted for the McKinney, Texas Post Office in 1933 as a part of the Public Works of Arts Project. On display in the Collin County History Center in McKinney, Texas (former Post Office building) is an important 1930s era mural painted by Frank Klepper (1890-1952.). Klepper was born in Plano and grew up in McKinney and is still the town’s best known artist. In 1914 he left Texas to study at the Art Institute of Chicago. When the U.S. entered World War I in 1917, he volunteered for the army and served in France painting camouflage for the 36th infantry division. After the war, he remained in Paris for a time, studying at the American Art Training Center. In 1920 he returned to McKinney and set up a studio at 505 W. Davis, where he also lived with his father John, sister Lulu, and her husband Wylie McKinney. Frank quickly established himself as an artist specializing in landscapes. In that same year, he won the Arthur A. Everts medal for landscape painting at the 1920 Texas Artist Exhibition which helped establish his reputation. In 1927, he left McKinney for Dallas. Klepper’s success enabled him to devote 1928 to studying the art of France and Belgium and to work with George Elmer Browne of New York. He also spent time at Taos, New Mexico. In 1929 he began teaching evening classes in etching, and later ceramics, for the Dallas public school system. He was visiting art director of Kidd-Key College in Sherman in 1931. The following year he moved back to Dallas where he continued to teach for over twenty years, which including a three-year stint as the art director of the Southwestern School of Fine Arts. In 1937 he visited the Orient and acquired a valuable collection of oriental porcelain and Chinese treasures. During the second world war, he taught art in the occupational therapy department at Ashburn General Hospital in McKinney. During his career, Klepper moved from his impressionistic landscape style to a concentration on “Deep South” pictures and to experiments with symbolic painting. His increased skill in lithography and etching won him the Southern States Art League first prize for bookplate design in 1932. Yet he remained best known for his landscapes and was selected to exhibit his work at the Texas Centennial Exposition in 1936. The New Deal provided him the chance to paint a public mural in the Old McKinney Post Office. This mural was sponsored by the Public Works of Art Project (PWAP), created by the New Deal in late 1933. It was the first Federal program designed to provide relief work for artists. It predated the WPA, which would itself never fund art projects in Texas. Nonetheless, this mural is sometimes mistakenly characterized as a WPA project, which it was not. The PWAP existed for only a few months in 1933-1934 and was later succeeded by other federal programs designed to bring relief to artists and create high quality art for government buildings. The PWAP paid artists weekly wages of $25.50 to $42.50, which were equivalent to those paid to skilled laborers. The artists so employed created art work for the decoration of buildings supported by federal, state or local taxes. When the PWAP was announced for Texas, Frank Klepper was able to secure support to create a mural for the Post Office in his home town of McKinney, and later for Prairie view College (Now Prairie view A&M). Klepper visited the McKinney Post Office in late 1933 to check out the space and told the postmaster that he was hoping to get the job of painting a mural for it. Postmaster Wallace C. Wilson, who had hoped to benefit from this program, gladly gave his permission, proud that McKinney had one of the first government buildings to benefit from this program. Klepper chose as his theme the transit of Ben McCullough’s casket through McKinney, a major local event during the Civil War. McCullough had been killed at the Battle of Elkhorn Tavern, Arkansas. His body being brought back to his home in Gonzales, passed through McKinney just as Capt. Alfred Johnson’s Spy Company was departing for the war. From the balcony of the Tucker Hotel a young girl, Laura Hocker, presented a flag to the company of soldiers and is said to have delivered a rousing speech. The Tucker Hotel on the northeast corner of the square burned down in 1875. The McKinney Art Club hosted the unveiling ceremony on the afternoon of February 28, 1934 before an overflow crowd at the post office. Mrs. T. E. Craig, president of the McKinney Art Club, the postmaster, mayor and several judges were among the speakers at the ceremony. Klepper students, friends and fellow artists from Sherman and Denison, Collin County and Dallas attended, including Texas artists E.G. Eisenlohr, Allie Tennant, and Jimmie Swann. A bust of Frank Klepper by noted sculptor Allie V. Tennant, formerly located at the North Texas History Center, was recently moved to McKinney’s Heard-Craig Center for the Arts, where there also hangs a formal portrait of him. There are no records of Frank ever being married or having any children. Frank died of a heart attack on 04 Jun 1952 and in his will he left a valuable collection of books and sculptures to the Memorial Library in McKinney (Old Post Office Museum). He is buried in the Plano Mutual Cemetery. Honorable Mention, Texas Federation of Women’s Clubs, Lubbock, Texas, 1931. He is represented in the John Vanderpoel Memorial Collection, Chicago; the Arkansas State Art Association, Little Rock, and in numerous private collections throughout the country.